Leg Exercises - Knowledge is Power - and independence! knowledge is power - and independence! When it comes to leg exercises, there is a lot of sloppy teaching out there. The reason no one has told you what you are about to learn is the same old - everyone is overworked, short-staffed and short on time. It's no excuse but it has left thousands with only half the story on why their leg exercises are so vitally important. 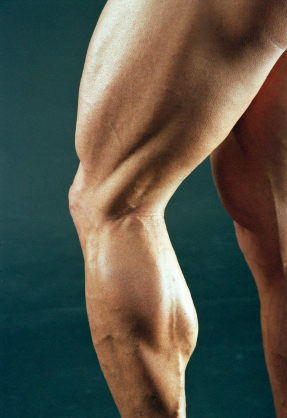 Your legs do more work and require a lot more work than most of your other muscles to maintain or strengthen. Think about it. Your legs help you: drive, walk, run, play golf, pick up things, dance, swim, climb steps, climb mountains. Your legs carry you from point A to point B! Closely related to leg exercises is the trunk or core. You may have heard a lot of fancy stuff out there when it comes to core training. There IS a lot of fancy stuff, but when you get back down to the basics, it's really all about the basics. When your core (or trunk) is not strong, your legs don't have much to push against for strength. At times, a week core can contribute more to fatigued legs than the legs themselves! We'll talk about core later - but for now just remember that core work should not be left out. I'll teach you how to make core work fun while giving you the functional results you need! With so much high endurance and strength demands, our leg muscles were built to deliver a lot of power. What does this mean for the rehabilitating leg? There is a time in your rehab or strengthening process that you really need to put in the time and effort to challenge your muscles for growth, power and endurance. Like I said, there is a time. That time is not in the recovery room from a total knee replacement (but later on at home!) But, the idea is simple... it takes a good work out to get strength, endurance and power built back into those legs! Discover the ins and outs, the tips and tricks of making the most of your home exercise program. Learn it, do it, repeat it for a strong future!